mind. I’m out of mine & out of sight. you cloak your eyes & steal the cream. So curiosity is killing us. My dress is black & backless. “A Proverb” is reprinted from The Journal. Amy Schrader holds an MFA in poetry from the University of Washington. She was a recipient of a 2008 Artist Trust Grants for Artist Projects (GAP) award, and her poems have most recently appeared or are forthcoming in Coconut, The Journal, ILK, Bateau, and the Fairy Tale Review. She lives in Seattle. as a turkey in the rain. Mary Elizabeth Gillilan is the editor-in-chief of Clover, A Literary Rag. She leads writers groups at the Independent Writers’ Studio in Bellingham, Washington. Her novel, Tibet, A Writer’s Journal was published in 2007. Her greatest achievements are her two wonderful daughters. She lives in a hundred year old house in Bellingham with three rescue dogs and a cat. Cora Goss-Grubbs lives in Woodinville, WA, with her spouse and two sons, in a house sandwiched between a wetland and a blueberry farm. Her work has appeared online at Literary Mama, and Diverse Voices Quarterly (Pg. 39). Her poems and essays have been published in She’s Shameless: Women write about growing up, rocking out and fighting back by Tightrope Books; Pontoon 10, an anthology of Washington State Poets; and Calyx: A Journal of Art and Literature by Women. She is a 1998 and 2010 Hedgebrook alumna and 2003 Jack Straw Productions writer-in-residence. Currently Cora is working on a young adult novel. what did moths do for amusement? in his Menlo Park single bed. Aaron Silverberg lives and writes in Seattle. He is a personal life coach and the author of several poetry collections, including Thoreau’s Chair and Diamonds Only Water Can Wear. by land, but by stars. “Editing a Vapor Trail” is reprinted from the Bellingham Review and the chapbook Editing a Vapor Trail (Pudding House Press). Karen Bonaudi has led poetry workshops in elementary schools, taught adult creative writing classes, conducted workshops and critique panels, and performed with the All Bets Are Off troupe. Among other publications, her poetry has run in the Bellingham Review, Salal Review, South Dakota Review, Pontoon 2, on-line whispers & shouts and others. Her chapbook Editing a Vapor Trail was published by Pudding House Press. She lives and works as a private contractor in Moses Lake and publishes www.theheroicself.com/blog/ and www.sirensrock.com on the web. sometime before the year is over. Out of bed, she said, and on your knees. which I and my two lambs eagerly wait, Amen. twining our feet together for warmth. one would be saved, the other doomed. plunged into to the icy lake of Hell? My salvation would be my sister’s doom. until the cuckoo clock panted midnight. Mother served oatmeal and red-eyed silence. “”New Years Eve, 1921” is reprinted from Poets West Literary Journal. Roberta Feins was born in New York, and has also lived in North Carolina and (currently) in Seattle. She works as a computer consultant. Roberta received her MFA in poetry from New England College in 2007. She has been published in The Cortland Review, Pif Magazine, Antioch Review, Tea Party, Floating Bridge Review, The Lyric, and Five AM. Roberta is an editor of the e-zine Switched On Gutenberg. I’ve heard third-hand each stanza is a room. is a room and so is each tulip. is a room with the promise of future rooms. my car a room, but it’s just traffic. is a room with walls of burnt skin. when my singing’s done. All these rooms. All the clouds drifting through their open doors. No wonder I am always outside. “Room” is reprinted from Sixth Finch. Originally from a small town in coastal Maine, Bill Carty moved to Seattle after receiving a BA from Dartmouth College and an MFA from University of North Carolina-Wilmington. His poems are published in numerous local and national journals, including Sixth Finch, Diagram, Floating Bridge Review, Transom, and Page Boy. His chapbook “Refugium” was recently published by alice blue books. Bill’s first full-length manuscript, “Tomahawks,” has been named a finalist for the National Poetry Series, the Four Way Books Intro Award and Saturnalia Books. In 2010, he participated in the Jack Straw Writers Program, and he is a Made at Hugo House fellow for 2012-13.
like hands waiting to unfold. 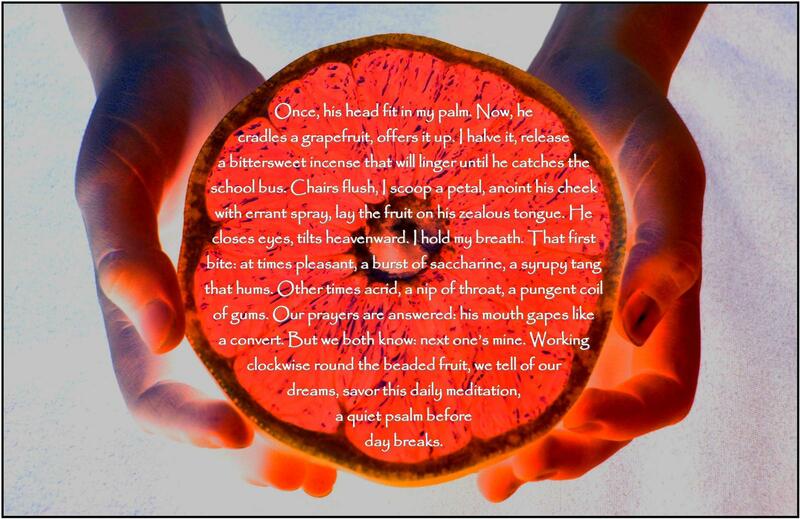 “Hunger” is reprinted from Sparrow, now available from Writers & Books. Bethany Reid teaches American literature and creative nonfiction at Everett Community College — and the inevitable college composition. She and her husband live in Edmonds with their three teenaged daughters, and their three cats. Her first full-length collection, Sparrow, is just released from Writers & Books. “Ghosts” previously appeared in Cutbank 77. John Wesley Horton (aka Johnny Horton) spends many summers teaching creative writing in Rome, Italy for the University of Washington. A New Englander by birth, he grew up in the Midwest and now lives and works in Seattle. He’s recently published poems in CutBank, Poetry Northwest, Borderlands, Notre Dame Review, Alive at the Center, and City of the Big Shoulders: An Anthology of Chicago Poetry (U. of Iowa). a dollar sign stretched over white, dry knuckles. caught you—that was when you’d first taught me m__erf__er. I was “Rocky” until I got my front teeth busted. with “Street Fighter II” and Chung Li’s spinning leg kick. drunk, stuck her hands in our shorts to see how we’d grown. broke my heart like a bottle rocket that won’t burn. turned the light off, and the gunfire ceased. “Blood Brothers” previously appeared in City Arts Magazine. Born in Queens, NY, Brian McGuigan currently writes in Seattle, WA. He is the curator of the popular reading series, “Cheap Wine and Poetry” and “Cheap Beer and Prose,” and the Program Director at Richard Hugo House. In 2010, McGuigan was shortlisted for The Stranger’s Genius Award in Literature, and in 2008, he was a fellow in the Jack Straw Writers Program. Spankstra Press published his chapbook of poetry, “More Than I Left Behind,” in 2006. His poetry and writing have appeared in City Arts, Seattle Magazine, Rivet Magazine, Filter Literary Journal, Slipstream and others.